The Vlastimirović dynasty (Serbian: Властимировићи, Vlastimirovići[A]) was the first Serbian royal dynasty, named after Prince Vlastimir (r. 831–851), who was recognized by the Byzantine Empire. The dynasty starts with the Unknown Archont, who ruled during Emperor Heraclius (610–641). The Vlastimirović ruled Serbia until the 960s, when some Serbian lands were annexed, first by Bulgaria, then the Byzantine Empire. Slavs ravaged Eastern Roman territories beginning in 518, and had by the 580s conquered much of the Central Balkans. 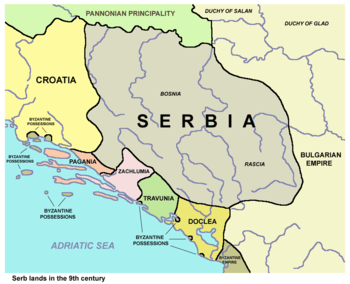 Archaeological evidence in Serbia and Macedonia point that the Serbs reached the Balkans between 550–600, as much findings; fibulae and pottery found at Roman forts point at Serb characteristics. One of the fundamental sources for the early Serbian history is the work of Byzantine Emperor Constantine VII Porphyrogenitos (913–959), De Administrando Imperio. In eight chapters, the settlement of Serbs and their early history is described up until the reign of the author. The 32nd chapter, with the sub-chapter On the Serbs and the lands that they currently inhabit, gives a short note on the origin of the Serbs, their homeland, and continues with the history of members of the oldest ruling family of the Serbs. The progenitor, according to Porphyrogenitos, was the prince that led the Serbs to the Balkans during the reign of Heraclius (r. 610–641). The author gives the early genealogy: "As the Serb Prince who fled to Emperor Heraclius" in the time "when Bulgaria was under the Rhōmaíōn" (thus, before the establishment of Bulgaria in 680), "by succession, his son, and then grandson, and so on, of his family rules as princes. After some years, Višeslav is born, and from him Radoslav, and from him Prosigoj, and from him Vlastimir.". The time and circumstances of the first three rulers are almost unknown. It is supposed that Višeslav ruled in c. 780, but it is unclear when Radoslav and Prosigoj would have ruled. When the Serbs were mentioned in 822 (the oldest mention of them) in the Royal Frankish Annals ("the Serbs, who control the greater part of Dalmatia"; ad Sorabos, quae natio magnam Dalmatiae partem obtinere dicitur) one of those two must have ruled Serbia. Dalmatia, in the antique period, stretched from modern-day Dalmatia far into the hinterland, northwards close to the Sava river, and eastwards to the Ibar river. Višeslav's great-grandson Vlastimir began his rule in c. 830, and he is the oldest Serbian ruler of which there is substantial data on. Vlastimir united the Serbian tribes in the vicinity. The Serbs were alarmed, and most likely consolidated due to the spreading of the Bulgarian Khanate towards their borders (a rapid conquest of neighbouring Slavs), in self-defence, and possibly sought to cut off the Bulgar expansion to the south (Macedonia). Emperor Theophilos (r. 829–842) was recognized as the nominal suzerain (overlord) of the Serbs, and most likely encouraged them to thwart the Bulgars. The thirty-year-peace treaty between the Byzantines and Bulgars, signed in 815, was still in effect. According to Constantine VII, the Serbs and Bulgars had lived peacefully as neighbours until the invasion in 839 (in the last years of Theophilos). It is not known what exactly prompted the war, as Porphyrogenitus gives no clear answer; whether it was a result of Serbian-Bulgarian relations, i.e. the Bulgar conquest to the southeast, or a result of the Byzantine-Bulgarian rivalry, in which Serbia was at the side of the Byzantines as an Imperial ally. According to J. B. Bury, it was not unlikely that the Emperor had a part in it; as he was in war with the Arabs, he may have pushed the Serbs to drive the Bulgars from western Macedonia, which would benefit them both, hence Malamir's action. V. Zlatarski supposed that the Emperor offered the Serbs complete independence in return. According to Porphyrogenitus, the Bulgars wanted to continue their conquest of the Slav lands - to force the Serbs into subjugation. Presian I (r. 836–852) launched an invasion into Serbian territory in 839, which led to a war that lasted for three years, in which the Serbs were victorious; Presian was heavily defeated and lost a large number of his men, made no territorial gains and was driven out by the army of Vlastimir. It is believed that the Serbs held out in their hardly accessible forests and gorges, and knew how to fight in the hills. According to Živković, it is possible that the Bulgarian attack came after the failed invasion of Struma and Nestos in 846 (see below): Presian may have collected his army and headed for Serbia, and Vlastimir may have participated in the Byzantine–Bulgarian Wars, which would mean that Presian answered to a direct Serbian involvement. Political map of the Western Balkans, 9th century. After the victory over the Bulgars, Vlastimir's status rose, and according to Jr. Fine, he went on to expand to the west, taking Bosnia, and Herzegovina (Zahumlje). Vlastimir married off his daughter to Krajina, the son of a local župan of Trebinje, Beloje, in c. 847–48. With this marriage, Vlastimir elevated the title of Krajina to archon. The Belojević family was entitled the rule of Travunija. Krajina had a son with Vlastimir's daughter, named Hvalimir, who would later on succeed as župan of Travunia. Vlastimir's elevation of Krajina, the practical independence of Travunija, shows, according to Živković, that Vlastimir was a Christian ruler who very well understood the monarchal ideology that developed in the early Middle Ages. Soon after 846, with the end of the thirty-year-truce, Malamir (or Presian) invaded the regions of the Struma and the Nestos, and Empress-Regent Theodora (r. 842–855, the wife of Theophilos) answered by attacking Thracian Bulgaria. A brief peace was concluded, then Malamir proceeded to invade Macedonia. The Bulgars also imposed rule on the Morava region, the frontier region between Serbia and the Bulgarian Khanate. The Byzantines were also active in the hinterland of Dalmatia, to the west of Serbia; the strategos of the cities of Dalmatia came into conflict with Frankish vassal, Croatian Duke Trpimir in 846 or 848, in which battles the strategos was defeated. The defeat of the Bulgars, who had become one of the greater powers in the 9th century, shows that Serbia was an organized state, fully capable of defending its borders; a very high military and administrative organizational frame to present such effective resistance. It is not known whether Serbia at the time of Vlastimir had a fortification system and developed military structures with clearly defined roles of the župan. Prince Mutimir (r. 851–891), the son of Vlastimir, managed to defeat the Bulgars once again in 834–835, also capturing the son of the Bulgar Khan. The Serbs and Bulgars concluded peace, and the Christianization of the Slavs began; by the 870s the Serbs were baptized and had established the Eparchy of Ras, on the order of Emperor Basil I. The remaining years, well into the 920s, are characterized by dynastic civil wars. Delegation of Croats and Serbs to Emperor Basil I.
Petar Gojniković managed to defeat his cousin, the reigning Prince Pribislav Mutimirović in 892. Petar was recognized by the Bulgars, now the greatest power in the Balkans, although the peace was not to last; the Byzantines had sent an envoy to Serbia promising greater independence in return of Petar leading an army against the Bulgars. 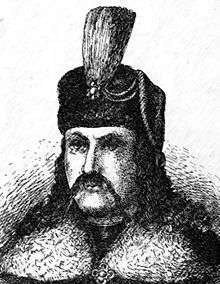 A Bulgarian ally, Mihajlo Višević, who had seen a threat in Petar during the latters conquering of Bosnia and Neretva, heard of the possible alliance and warned the Bulgarian Khan, who later sent a protege, Pavle Branović, to rule Serbia. In the meantime, Zaharija Pribislavljević is sent by the Byzantines to take the Serbian throne, he is however captured by Pavle and sent to Bulgaria. Pavle is now approached by the Byzantines, thus Zaharija is indoctrinated by the Bulgars. Pavle plans an attack on Bulgaria, but Khan Simeon is warned, and dispatches Zaharija with an army, promising him the throne if he defeats Pavle, which he did. Zaharija soon resumed his Byzantine alliance, also uniting several Slavic tribes along the common border to revolt against the Bulgars, several Bulgarian generals were beheaded, their heads sent to Constantinople by Zaharija as a symbol of alleigance. In 924 a large army led by Časlav Klonimirović, the second cousin, is sent by the Bulgars which ravages Serbia, forcing Zaharija to exile. Instead of instating Časlav, the Bulgars annex Serbia 924–927. Časlav takes the throne in 927, with the death of the Bulgar Khan, and immediately puts himself under Byzantine overlordship. Eastern Christian (Orthodox) influence greatly increases and the two maintain close ties throughout his regn. He enlarged Serbia, uniting the tribes of Bosnia, Herzegovina, Old Serbia and Montenegro (incorporated Pagania, Zahumlje, Travunia, Konavle, Bosnia and Rascia into Serbia, ι Σερβλια). He took over regions previously held by Michael Višević, who disappears from sources in 925. The De Administrando Imperio describes his realm: the shores of the Adriatic Sea, the Sava river and the Morava valley as well as today's northern Albania. The written information about the first dynasty ends with the death of Časlav. The Catepanate of Ras is established between 971–976, during the rule of John Tzimiskes (r. 969–976). A seal of a strategos of Ras has been dated to Tzimiskes' reign, making it possible for Tzimiskes' predecessor Nikephoros II Phokas to have enjoyed recognition in Rascia. The protospatharios and katepano of Ras was a Byzantine governor named John. Data on the katepano of Ras during Tzimiskes' reign is missing. Byzantine military presence ended soon thereafter with the wars with Bulgaria, and was re-established only ca. 1018 with the short-lived Theme of Sirmium, which however did not extend much into Rascia proper. Five decades later, Jovan Vladimir emerges as the Prince of Serbs, ruling as a Bulgarian vassal from his seat at Bar. A possible descendant, Stefan Vojislav, leads numerous revolts in the 1030s against the Byzantine Emperor (the overlord of the Serbian lands), successfully becoming independent by 1042. His realm included all lands earlier held by Časlav Klonimirović, and he would be eponymous to the second Serbian dynasty, the Vojislavljevići, who were based in Duklja. The latter may possibly be a branch of the Vlastimirović dynasty. A cadet branch of the Vojislavljević dynasty, the Vukanovići, emerge as the third dynasty in the 1090s. It was named after Grand Prince Vukan who held Rascia (the hinterland) under his cousin King of Duklja Constantine Bodin (ca. 1080–1090) in the beginning, but denounced any overlordship in 1091 when he had raided much of the Byzantine towns of Kosovo and Macedonia. The Nemanjić dynasty, the most powerful dynasty of Serbia, is founded with the emergence of Stefan Nemanja, also a descendant of the same line. Unknown Archon (~610–641+), Leader of Serbs and their Byzantine Sclaviniae under Heraclius. Vlastimir (836–~850) (Founder), Defeated the Bulgars at the Bulgaro-Serbian Wars 839–846. Mutimir (~850 – † 891–893). Petar Gojniković (~892–918), captured by Bulgarians, died in captivity. Wikimedia Commons has media related to Vlastimirović dynasty. ^ In historiography, the dynasty is known as Vlastimirović, a patronymic derived from Vlastimir. It is scarcely named Višeslavić, after Višeslav, Vlastimir's great-grandfather. It is also known as the "old Serbian dynasty". ↑ Đorđe Janković (2008-09-26). "The Slavs in the 6th century North Illyricum". 1 2 3 4 5 6 7 8 9 Ivić et. al 1987, p. 21. ↑ Živković 2006, pp. 11–13. 1 2 3 4 5 6 7 8 Runciman 1930, ch. 2, n. 88. 1 2 3 4 5 6 7 Bury 2008, p. 372. 1 2 Fine 1991, pp. 108–110. 1 2 3 Ćorović 2001, ch. 2, III. 1 2 Živković 2006, p. 13. ↑ Živković 2006, pp. 14–15. ↑ Fine 1991, p. 110. 1 2 Živković 2006, p. 17. 1 2 Živković 2006, p. 18. Komatina, P. (2010). "The Slavs of the mid-Danube basin and the Bulgarian expansion in the first half of the 9th century" (PDF). Zbornik radova Vizantološkog instituta. Belgrade: Serbian Academy of Sciences and Arts - SASA, Institute for Byzantine Studies (47): 55–82. doi:10.2298/ZRVI1047055K. ↑ Živković 2006, p. 19. ↑ Stephenson, Paul. The Legend of Basil the Bulgar-slayer. p. 42. ↑ Bojana Krsmanović; Taxiarchis G. Kolias (2008). The Byzantine province in change: on the threshold between the 10th and the 11th century. Institute for Byzantine Studies, Serbian Academy of Sciences and Arts. p. 189. ↑ Samardžić & Duškov 1993, p. 24. Aleksa Ivić; Dušan Mrđenović; Dušan Spasić; Aleksandar Palavestra (1987). Rodoslovne tablice i grbovi srpskih dinastija i vlastele. Belgrade: Nova knjiga. Veljko Đ. Đurić (March 1998). "bili smo sadeliki smomali". Srpsko nasleđe, Istorijske sveske, broj 3. NIP "GLAS".